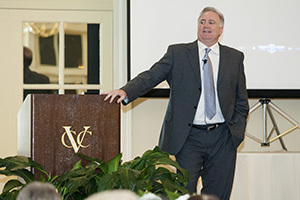 Giving with a cheerful heart makes every day like Christmas, The Blind Side's real life dad Sean Tuohy told a Samford University Legacy League audience Thursday, May 2. He had said the same thing when a news reporter asked him if Baltimore Ravens football player Michael Oher had "won the lottery" after being adopted by the Tuohy family as a homeless teenager. "We gave Michael a house and hope. He gave us Christmas every day. You tell me who won the lottery," Tuohy said he told ABC's Robin Roberts for a special 20/20 report. The story of how the Memphis, Tenn., family took in Oher, supported him though school, and eventually adopted him was chronicled in a book and Academy-Award winning movie. "The last six years have been crazy for our family," said Tuohy. The 2009 movie has been seen by more than a quarter-billion people, including most of the 220 Legacy League supporters at the Scholarship Gala. "Everybody thought it was a football movie, but it was really a movie about giving," said Tuohy, who was played by actor Tim McGraw. His wife, Leigh Anne, was played by Sandra Bullock, who won an Academy Award for Best Actress. Her father, John Bullock, attended the gala at Vestavia Country Club. Tuohy complimented Legacy League members for their own giving and commitment to scholarships for Samford students. "If you don't think you're making a difference, you're wrong, because you are," he said. "I could pick any table in this room, and I guarantee there's a story there every bit as good as ours." He said he felt God's hand in the events that brought Michael into his family and changed their lives forever. "This didn't happen by accident," he said of Michael being enrolled in the same private school, "which he shouldn't have been in," as the Tuohy's daughter. Tuohy also cited the uncanny availability of a retired teacher to tutor Michael, "who had never been told the value of an education," and the unexpected success of the movie, which had been "buried twice" by producers before being made on a relatively low $20 million budget. It has grossed more than $300 million. "Michael was sent to us," he said. "We just weren't stupid enough to walk away." Tuohy, a former University of Mississippi basketball player who became a successful owner of 70 fast-food restaurants, is in his 11th season as an NBA broadcaster for the Memphis Grizzlies. In 2010, he and his wife released the book In a Heartbeat: Sharing the Power of Cheerful Giving, which became a New York Times bestseller. They have also established The Making It Happen Foundation to promote awareness, provide hope and improve living standards for children fighting to survive in the invisible cracks in society. The gala featured remarks by Legacy League scholarship recipient Brennen Febles. The sophomore accounting major from Franklin, Tenn., told Legacy League members that he was at Samford only through their help. Febles said he had planned to attend a public university until friends kept saying good things about Samford, which he knew was out of his family's budget. "I thank God for creating this experience. I am humbled to receive from such a wonderful group of people," he said, adding that it's not just the money, "but the relationships, the gift cards and exam care packages you send." Legacy League president Penny Kimrey noted that Febles is among 70 students who have benefited from "life-changing" Legacy League scholarships. "You are making an impact in the lives of students and their stories that couldn't be told without your support," she said, adding that the group's newest endowment effort, a Legacy League Adoption Scholarship, will assist Samford students who are adopted or in foster care. Legacy League executive director Jeanna Westmoreland thanked Kimrey for her two-year service as president, citing her organizational skills during the group's name change from Samford Auxiliary as well as her fund raising efforts. Kimrey also accommodated the changing makeup and needs of the membership, and created new opportunities for relationships with scholarship recipients and international students, said Dr. Westmoreland.